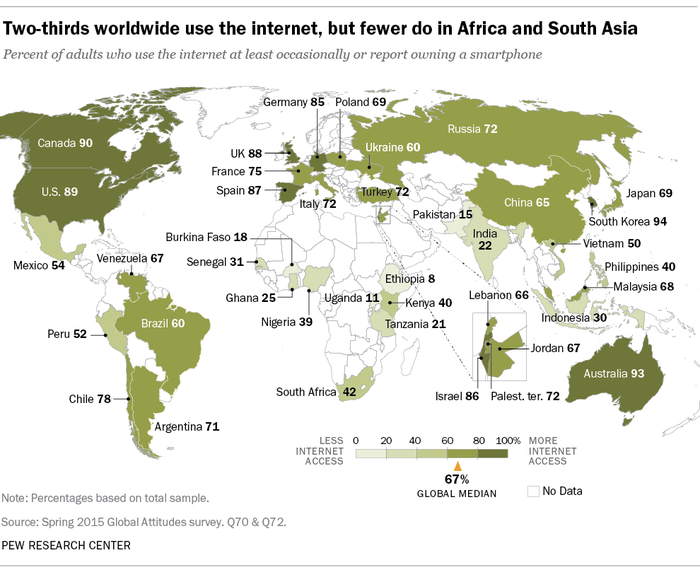 In 2013, a median of 45% across 21 emerging and developing countries reported using the internet at least occasionally or owning a smartphone. In 2015, that figure rose to 54%, with much of that increase coming from large emerging economies such as Malaysia, Brazil and China. 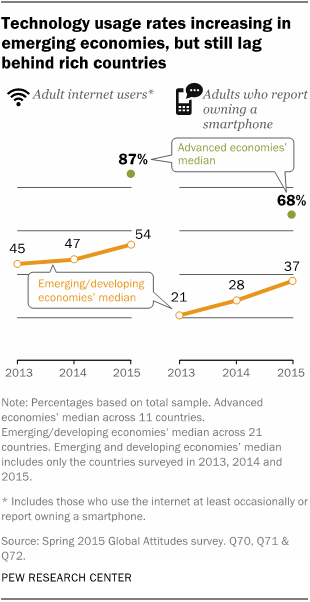 By comparison, a median of 87% use the internet across 11 advanced economies surveyed in 2015, including the U.S. and Canada, major Western European nations, developed Pacific nations (Australia, Japan and South Korea) and Israel.2 This represents a 33-percentage-point gap compared with emerging and developing nations. Once online, 76% of internet users across the 40 countries surveyed use social networking sites, such as Facebook and Twitter.3 And the most avid social networkers are found in regions with lower internet rates. 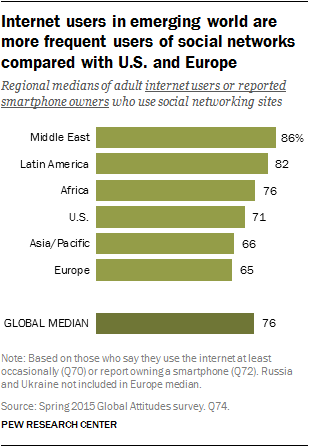 Roughly three-quarters or more of internet users in the Middle East (86%), Latin America (82%) and Africa (76%) say they use social networks, compared with 71% in the U.S. and 65% across six European nations. Overall, internet users in emerging and developing countries are more likely to use social media compared with those in the developed world. It is important to remember, however, that internet access rates in the emerging and developing world still trail those of advanced economies, so the number of people participating in social networking is still smaller as a share of the total population in many of these emerging countries. Internet and smartphone rates are also related to overall country wealth. Richer nations tend to have higher internet access rates and higher reported smartphone ownership. But as people in emerging and developing economies grow richer and become better educated, technology use is likely to grow. As in previous years, within every country surveyed with sufficient sample size to analyze, people with more education and higher incomes are more likely to use the internet or own a smartphone than those with lower incomes and less education. This is true in both the developing and developed world. Additionally, within nearly every country, Millennials (those ages 18 to 34) are much more likely to be internet and smartphone users compared with those ages 35 and older. This significant age gap appears in both advanced economies and among emerging and developing nations. Younger internet users also tend to access the internet at least daily and participate in social networking at higher rates than their older counterparts. These are among the main findings of a newly released Pew Research Center survey conducted in 40 nations among 45,435 respondents from March 25 to May 27, 2015. * Includes adults who use the internet at least occasionally or report owning a smartphone. ** Russia, Tanzania and Uganda excluded from education due to insufficient sample size. Turkey and Venezuela excluded from income due to insufficient sample size. Note: Percentages based on total sample. All reported differences are statistically significant. Source: Spring 2015 Global Attitudes survey. Q70 & Q72. † Includes adults who report owning a smartphone. ** Russia, Tanzania and Uganda excluded from education due to insufficient sample size. Turkey and Venezuela excluded from income due to insufficient sample size. Ethiopia age difference not statistically significant. Source: Spring 2015 Global Attitudes survey. Q71 & Q72. 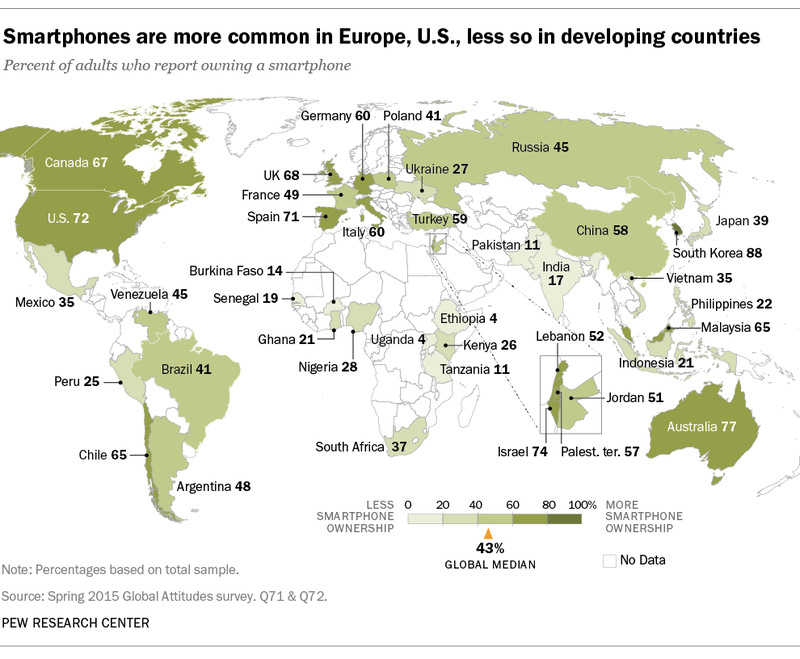 Smartphone ownership rates have skyrocketed in many countries since 2013. This includes increases of over 25 percentage points among the total population in large emerging economies such as Turkey (+42 points), Malaysia (+34), Chile (+26) and Brazil (+26). South Korea stands out as the country with the highest smartphone ownership rate, with 88% of respondents saying they own one. The countries with the least smartphone ownership rates are also among the poorest: Tanzania (11%), Uganda (4%) and Ethiopia (4%). In a number of emerging and developing countries, more people have access to the internet and are also using it more frequently. In 12 emerging nations surveyed in 2014 and 2015, there were significant increases in the share of adult internet users who say they access the internet several times a day, including in Nigeria (+20 points), Ghana (+19) and China (+13). There are gender gaps on many aspects of technology use. For example, in 20 nations, men are more likely than women to use the internet. These differences are especially stark in African nations. Elsewhere, equal shares of men and women use the internet. But large gender gaps also appear on reported smartphone ownership (men are more likely to own a smartphone) in many countries, including Mexico (+16), Nigeria (+13), Kenya (+12) and Ghana (+12).